If you take a closer look at the story behind Star Trek, you can very quickly see various mythological transformations that recur time and again and have made Star Trek what it is today: a modern myth. As a narrative order, the series and films repeatedly take on a self-critical position that reflects the own abysses and dark sides of the actual utopia of Star Trek, be it the affinity for technology, the humanistic image of man or scientific approaches. Particularly Star Trek Generations is to be emphasized here, because here the myth patchwork is still extended, but Darmok also shows an interesting variation, but how is this currently renegotiated with Star Trek: Discovery? 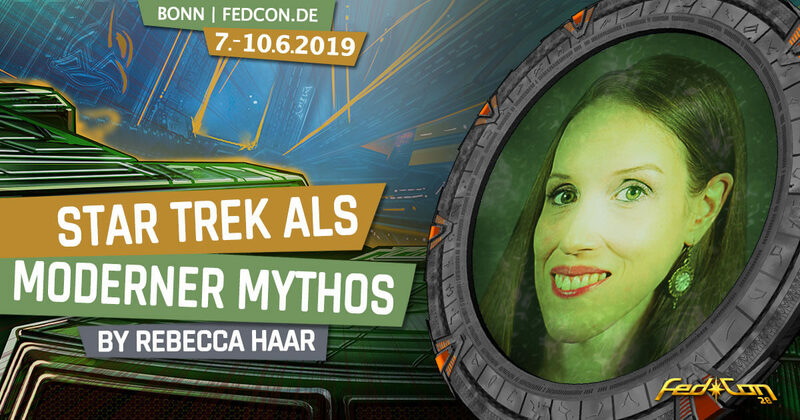 In the lecture Star Trek as modern myth Rebecca Haar gives an overview about the corresponding development of Star Trek at FedCon and also analyses the different time lines in this context. Dr. Rebecca Haar is a literary and media scholar who has always had a penchant for science fiction. She has specialized in simulation and virtual worlds, which is also reflected in her dissertation, which deals, among other things, with the question of how perception changes when virtual worlds and reality increasingly overlap in everyday life. Of course, between cyberspace, metaversum and matrix, one or the other holodeck can also be found there. For some time now, Rebecca Haar has also been giving lectures in which she combines literature and cultural studies with popular culture, in particular with comics, Star Trek and Doctor Who. In addition to conferences at universities, she has also lectured at conventions and festivals, including the FedCon in Bonn, the "TimeLash" in Kassel and the "Crossmedia Fantastikfestival Dragon Days" in Stuttgart.